What's the news? I checked in anticipation and got a nice "your system is up to date"
still nothing for me here in GA.
Nada for me too in GA, though I'll be heading back towards WV soon. as an ex-vz user, I do not miss this anticipation. wonder what fresh bloat vz will have in store, and how much theyre making off of each one of you by selling space on your phones. No update waiting for me today....boo. Here's the latest. After a 50 minute installation I can say that now I have Android v6.0. I'm still cleaning up a few things but so far so good. I'll send more updates during the day. bluesqueen23, Uzi, SteelGreek and 6 others like this. Awesome!! Thanks for the screenshot... gives the rest of us hope that it's coming! Any word on if it adds VVM option or fixes the short code text issue? No update yet here in socal. Will check tonight when back on my home wifi. bluesqueen23 and 00stryder like this. No update here in Arizona. I have see the "unable to connect" message a few times. I'm at work and turned off wifi then hit the update buy nothing available. I can hear the Mrs. now..."all you do is check for updates. Why won't you talk to me!" Last edited by Gray; 11-04-16 at 10:19 AM. john_v, FF22 and 00stryder like this. Good to see that MM is finally coming to Verizon users. Checking the update doesn't do anything though. The system already does that for you and doing it manually several times a day doesn't put you ahead of the line or anything. I know its hard to stop doing because of the anticipation tho. Nothing for me in NJ yet. Same here, I've been checking since 7:00 am DST. Nothing for me yet and their website still says the last update was 06/06/2016. Forgive me but I'm a bit skeptical. I'm chatting with VZW on their site and the robot on the other end tells me there are no updates for the PRIV. Doesn't surprise me. They're often the last to find out. OP has posted screencaps, so I've got no reason to doubt for now. I doubt "James" from Hyderabad even knows what a Priv is. If only there was a way to get the good stuff. john_v, SteelGreek, tigrute and 3 others like this. I'll believe it when someone else or a few people report the upgrade. Nothing in those screen shots led me to believe it was a Verizon PRIV. I do hope it's true. Just don't want to get my hopes up. Isn't STV100-2 the Verizon model? Bla1ze's speculation in the blog article that it could possibly be a soak test kinda makes sense, if we're not seeing more numbers of people getting it today. 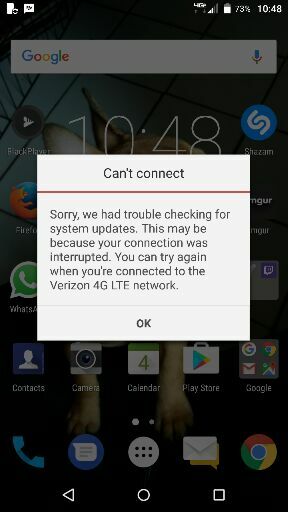 Soak test, heck, Verizon could waterboard me...just push me the update. SteelGreek, FF22, 00stryder and 1 others like this. why DTEK60 not available for Verizon? Connection issue when checking for updates. New update to Google Messenger.